The People’s Liberation Army Navy (PLAN) has reportedly launched its 40th Type56/056A Jiangdao-class corvette on October 28 at the Huangpu shipyard in the southern port city of Guangzhou, IHS Jane’s Defense Weekly reports. The PLAN is in the middle of a massive modernization push and is rapidly expanding its naval forces. Only a month ago, the PLAN launched its 39th Jiangdao-class corvette at the Wuchang shipyard in Wuhan. This was preceded by the launch of two other vessels of the class in September at the Liaonan shipyard in Lushun. The corvette launched on October 28 is the 12th to be built at the Huangpu shipyard. Three other Type56/056A Jiangdao-class corvettes are currently undergoing post-build sea trials or are in the process of being fitted out at the shipyard. Final installations and post-build trials usually take around 12 months for each ship. At least one of the vessels currently at Huangpu will be inducted into the PLAN by the end of the year. Three additional corvettes from other shipyards– Liaonan, Wuchang, and Hudong—will also likely be commissioned in 2016. 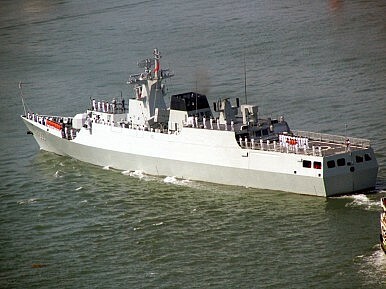 The first Type 056/056A Jiangdao-class corvette was launched in May 2012. The Chinese Navy at the moment is operating 27 Type 056/056A Jiangdao-class corvettes. The PLAN reportedly plans for a fleet of up to 60 warships of the class. One Type 056/056A Jiangdao-class corvette is launched ever six weeks, according to naval analysts. As I reported previously, in June, the 26th Jiangdao-class corvette, christened Qujing (pennant number 508), was inducted into the PLAN’s South Sea Fleet and will likely be deployed to the disputed Paracel Islands (See: “China Commissions New ‘Submarine Killer’ Warship for South China Sea”). However, the corvette does not feature a helicopter hangar suggesting that it will be difficult to permanently station a helicopter with airborne dipping sonar aboard a Type 056A corvette. The PLAN has also been launching 4,000-ton Type 054A Jiangkai II-class guided-missile frigates in rapid succession over the past decade. 22 (some sources indicate 23) Type 054A Jiangkai II-class frigates are currently in service with the PLAN with at least five additional ships of the class under construction. The multipurpose warships have been repeatedly deployed for anti-piracy operations in the Gulf of Aden since 2009 and have also been dispatched to a number of international maritime exercises over the years. China's corvette construction program continues.